As Genealogists, Family Historians, and Historians, we often have the need to repair and preserve our older Books. 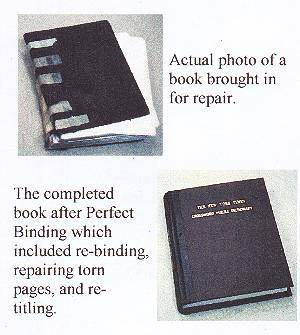 I have recently found a service in Charlottetown which does an excellent job of restoration and rebinding as a reasonable cost. Bill Wicks, recently rebound and restored the Register's copy of Past and Present of Prince Edward Island which was in very poor shape (sections separating, spine very loose - stitching coming out, pages frayed and coming out, and covers completely off), and also, Skye Pioneers, which was in the process of losing its covers. I could not have been more pleased with the service Bill provided, and therefore and in keeping with our policy of promoting P.E.I. books, and authors, and services to genealogists and historians, I am passing along the following information from Bill's pamphlet. The process involved in bookbinding has remained unchanged for centuries. The materials used today, however, are far superior to those used in the past. In many instances, modern glues have completely replaced the sewing of spines that once was the standard practice. We use only acid-free paper to ensure a longer life for books, and the glues we use are non-toxic and proven for strength and longevity. We would welcome the opportunity to discuss your bookbinding needs. Whether you are putting together a genealogy for your family, or if your favorite cookbook is falling apart, we can help. Or, perhaps you have a collection that you would like bound in hardcover. We can create guest books and personalize them for special occasions. If you, or your company keeps annual records or produces reports, they will look more professional and store much more easily if they are bound with a hardcover, rather than a spiral, soft cover binding, or not bound at all! Whatever the task, we would like you to think of us! Truth is Bill just does a really good job. His repair of Past and Present was nothing short of a miracle, and his rates were very reasonable, which is why I wanted to pass along his information to you. The business is 100% Island owned, and provides a quality of service that rivals anyone's. Give him a call for a quote on that precious old book you have been wanting to save, but figured you couldn't afford. Please tell him you found out about his service on the Register!